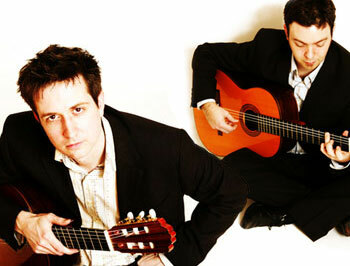 The Regondi Guitar Duo (formerly known as The Lee-Davies Guitar Duo) brings together two top, professionally-trained guitarists - Simon Davies and Nicholas Lee - who started playing together in 1992 whilst studying classical guitar at the Royal Northern College of Music from which both have degrees. Their ever-expanding repertoire includes selections of classical, jazz, Spanish, Flamenco and popular music, ideal music for receptions, dinners and parties. The duo has recorded a CD for Telstar Records - Guitar Serenade - and played at many concerts halls including the Manchester Free Trade and the British Music Information Centre. Their private function work has included numerous weddings (both ceremonies and receptions), parties and corporate celebrations at hotel, restaurants and other venues including the Westminster Boating Base and the Tower of London. The Regondi Guitar Duo usually perform for two-and-a-half hours over a three hour period. The Regondi Duo are based in the south east. See Pricing for details of travel costs, etc. "The Regondi Guitar Duo were a fantastic addition to our wedding ceremony. Their performance throughout was first rate and we had lots of good feedback about them from our guests too. We were also very grateful to them for learning a piece we had requested and for playing it so well during the signing of the register." "Simon was very good and created the perfect atmosphere for our evening"
"The Regondi Duo were terrific. Great musicianship, lovely people to talk to, beautiful to listen to. They really gave us a terrific accompaniment to our wedding reception. Thank you both, we heartily, readily recommend you to anyone seeking a class act with versatility, professionalism and the ability to create just the right atmosphere for an important occasion such as this. Terrific!" "Very professional and quality performance. Guests loved it. Thanks"
"The Regondi Guitar Duo were excellent and moved around the venue happily and with ease as guests and weather dictated. Many guests commented on how impressed they were." "I have received professional and excellent service from FJ and will recommend you to my friends." "We would just like to thank Function Junction and the duo for making our wedding the best day ever. The duo played beautifully and so many people commented on how lovely it was to listen to them. Thank you for making our wedding day perfect." "Guests commented what an extra special touch it was having the guitarists – we were really pleased with them and their performance. Brilliant!" "We had a fabulous day and the Lee Davies Guitar Duo added to it perfectly. There was no faulting their performance or professional conduct. Also thanks to Function Junction for such a seamless service." "The duo were superb, real professionals whose music added that special bit extra to our wedding. Everyone commented on how excellent they were and we would certainly recommend them to anyone." "They were superb, really made the day very special." "The guitar duo were extremely professional and played all of the music we requested. Many of our guests commented on how good they were and asked how we heard about them (we told them!) Please thank them on our behalf for such a fantastic performance. We will be recommending them and Function Junction to our friends." "Lee-Davies Guitar Duo were simply excellent and contributed towards making both Warren’s and my day absolutely fantastic, thank you so much to all of you, could not have done better! I really cannot describe enough just how great they were." "…they were excellent … nothing but good reports from everyone." This is just a selection of the The Regondi Duo's repertoire. For clients who don't specify a type of music the duo usually include a selection of classical, popular, Spanish, show tunes, etc. They can also adapt their programme to feature a specific type of music, eg: Spanish, South American, etc. The repertoire list is always expanding.